-Please read the section below “Do This In Memory”. 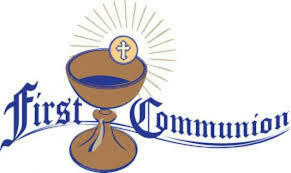 The preparation for First Holy Communion is an important year in the life of your child, it is also an important year for their class, their teachers, and also for you the parents/guardians. It is a special time too for the parish community. Your child’s faith journey began the day you brought your child to the Church to be baptised. And what a special day that was for you and the family. Now, that child has grown, they are about to take another step in their faith journey, as they prepare for First Holy Communion. And we all have a part to play. While the Home is the primary learning place, each parent/guardian will be asked to take on a special role over the next few months, to journey with your child as they prepare to receive the sacraments. Our teachers and sacramental coordinators do a wonderful job in preparing the children for their special day, but ‘Home is where the Heart is’. And the home is the domestic Church, where our children are influenced by what they see and learn. As part of our preparation for First Penance and First Holy Communion, we run in tandem a parish based programme, ‘Do this in Memory’. This programme is a continuous programme, connecting the classroom with the home and the parish. As part of the programme, there is an Information Night, (where we meet the parents), and there are eight Sundays set aside before First Eucharist (Holy Communion Day) where you and your child will have some participation in the Sunday Mass. The programme concludes during the parish celebration of the Feast of Corpus Christi. It is also hoped that you and your child will frequent mass regularly as your child prepares for this special day.